The 10 Best Cycling Races in Colorado! Biking is a popular activity here in the Centennial State. No matter if it’s road cycling or mountain biking, Colorado residents love to ride around on two wheels. There are a variety of races that occur in the state that cater to all different kinds of skill levels. The races on this list vary from challenging mountain rides to fun and family-friendly cruises. These 10 best cycling races in Colorado will inspire you to get out on a bike course this summer season. This nighttime bike race located in Colorado Springs is a fun ride for all ages. Choose either a 14 or 22-mile route, which both start and end at the Garden of the Gods Visitor and Nature Center. Come decked out in costume and illuminated bikes to this fun bike race that benefits the Trails and Open Space Coalition. Ride through Denver’s metro streets, greenways and mountain trails at the Denver Century Ride. This biking fest offers the option of five to 100-mile courses, catering to nearly any skill level. Kids will enjoy the bike parade, while all guests can benefit from the bike clinics and bike demos featured during race day. Located in the beautiful city of Steamboat Springs, the Tour de Steamboat is a 40 and 110-mile race through the Yampa River Valley. Nearly 1,000 cyclists come to the city for this one-day bike race. Live music and a barbecue dinner are waiting for participants at the race’s end. The Mount Evans Hill Climb is a challenging race that climbs more than 7,000 feet in elevation in 28 miles. Racers ride up Mount Evans Scenic Byway and are greeted with incredible views of the Continental Divide. Riders have been doing this scenic yet demanding race for nearly 50 years. This three-day, 157-mile race begins and finishes at Copper Mountain. If you aren’t ready to commit to this challenging tour, there is a 24-mile family ride too. Almost 2,000 riders complete this incredible race every year. The route takes riders on backcountry roads and mountain passes. This race supports the Children’s Hospital Colorado. The Triple Bypass race is a difficult endeavor, taking riders through three mountain passes and 10,000 feet of elevation gain within 120 miles. Starting in Evergreen, cyclists ride to Avon. This popular event is a week-long expedition that occurs every year. The route changes every year but you should definitely count on the fact that the ride will be a challenge. Ride the Rockies is usually around 400 to 500 miles with 30,000 feet in elevation change. Due to its popularity, only 2,000 registrants are awarded the lottery. With 6,000 feet of climbing in 78 miles, the Copper Triangle is a race that takes riders from Copper through Leadville and Minturn. This ride is considered one of Colorado’s classic alpine road races that is guaranteed to offer breathtaking views. 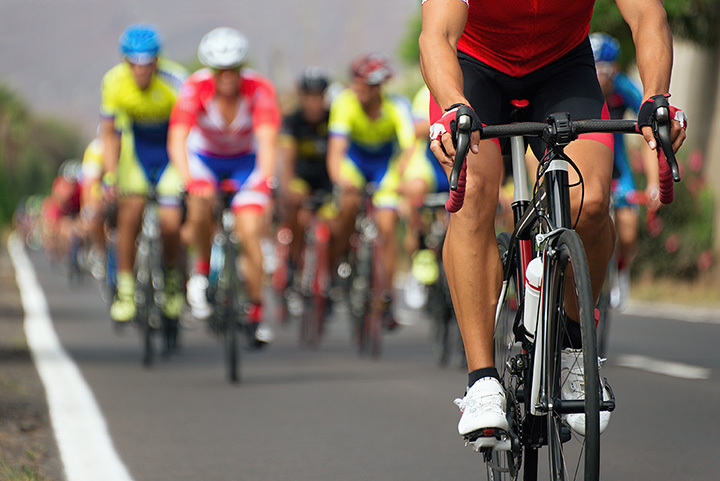 Pedal the Plains is a two-and-a-half-day race with a route in eastern Colorado. Riders will cycle passed Colorado’s farmland, rolling hills and grassland. Cyclists typically ride 35 to 75 miles per day. This grueling mountain bike race is recommended only for those in top physical condition. The Leadville Trail 100 MTB is a popular biking race that is nothing less than a challenge. Riders have 12 hours to complete 100 miles of dirt trail. The race is only open to 2,000 riders. This incredible event requires cyclists to climb 18,000 feet in elevation. View more Colorado Cycling and Bike Races.